It’s a dead tree, yeah I know but it has been pestering me for ages now. I have gone back to this particular tree stump three times now [or is that tree times]. Each time I go back either the lighting is all wrong or the results that come out of the camera are just not what I could see in real life. In reality this stump kind of looks like either one or two people, wrapped around each other or just having a good old fashioned solo hug. Come on, we’ve all had an aul solo hug from time to time. I think I have finally managed to capture that feeling of twisted limbs and spiralling arms. Some people I show this picture to can see two entwined bodies, others can only see the one. How about me?………..well, I can see only one person, she has her arm outstretched in the air and has long Medusa like hair. Actually now that I think of it, she is actually Medusa. 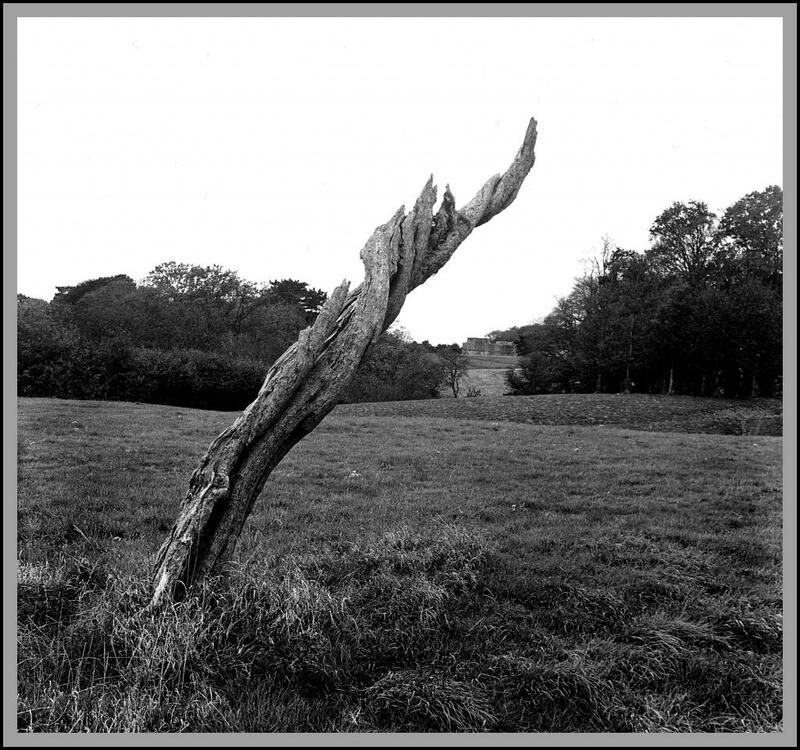 This entry was posted in Black and White Photography, Film Photography, Irish Landscapes, Phoenix Park, Photography and tagged Black and White Photography, Bronica, Film Photography, Kodak Tri-x, Medium Format, Medusa, Phoenix Park, Photography, psychiatrist. Bookmark the permalink. This is where I left offf the last time I visited. I contemplated the stub and my imagination was not very fertile. Hum! Oh well… I do like the twisting textures in there. That I can see! Hi Barbara, maybe its more obvious in real life, don’t know really. Sometimes I look at it and don’t see the same shapes as the previous time. This is what I love about photography, people can see two completely different things in the one image. Makes it so exciting. I think, the sword rising from the lake – especially with what could, with a little imagination, be an abbey or castle in the background. You are the first person to spot that tiny detail in the background, maybe because I know it’s there it just seems really obvious to me. Well spotted. It is my trusted old friend “The Magazine Fort” that you can see.